The ubiquitous Black Five provides as popular a model in all gauges as it performed in full size. One of their number was designed with Stephenson’s outside gear and little appears to be known as to the purpose of this exercise. It would be instructive to know what the official assessment of this gear was – the only comments of which I am aware are those of the drivers who liked the engine. The resultant figures in the official table of events must have taken a lot of time to evaluate. They are good results and it must have been clear even before she took to the road that these exceeded the event equality of the standard version. One can perceive in the gear the (then) current LMS thinking, so it was not an attempt to equip a Class 5 with a Western gear and this sort of idea probably survives only as an over-enthusiastic locospotters’ rumour. There appears to be some attempt to equate with the lead and exhaust characteristics of the Walschaerts’ equivalent, maybe for comparison – LMS penchant for 200-300 thou lead and some exhaust clearance at this time shows clearly enough. It would require a new generation to supplant this sort of thinking, whatever was happening on other railways. 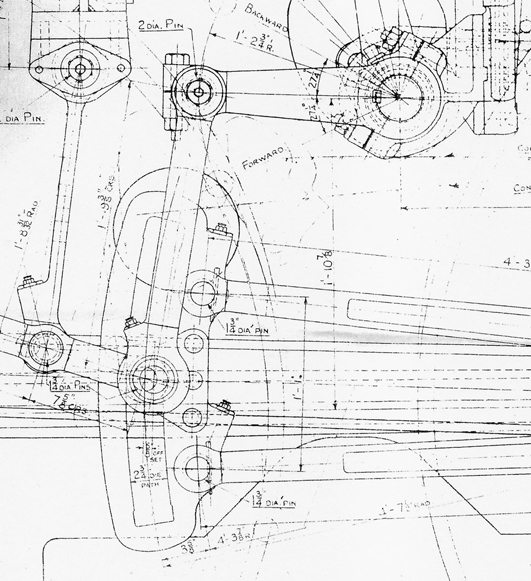 Unusually, the drawing displays a lot of dimensioning. The eccentric throw and advance angle lay out precisely the centres, yet these are confirmed by some superfluous trigonometry in four decimal places! CAD indeed proves it. Beyond that, the neat gear is perfectly conventional, employing a double return crank. The weighshaft position is exactly that of the other Class Fives so the gear size has been built around this(!) and its nominal sizes therefore reflect the GW layouts but without the rocker arm differences, hence the whole travel is derived from the gear itself. That is reflected in the 27.25o angle of the full gear lifting arms, where 25o suffices on the Western. The swing of the lifting link is not symmetrical around a vertical (1 in 24) meridian and lays open to question the suspension offset of 5/8ths, though this is not critical – more does it point to a shorter than optimum lifting arm length, as the lifting link should ideally be vertical at the half stroke for the offset to take proper effect. The two hangers which carry the motion from dieblock to valve rod transfer the travel to the upper plane in similar fashion to the GW arrangement and have perceptively little effect even though the first hanger is ahead, and not in line with dieblock – it occasions a very small die slip of little consequence in practice. It does, however, require a little interpretation in drawing out. If the extension bar is started at the dieblock centre and produced through the first hanger point it does not reach the elevation of the valve rod. Aligning the rod between the two hanger arcs places the dieblock a fraction below its central position to equalise the die slip about that centre through a cycle of the gear. The draughtsman casually ignores this (frequently done on motion drawings but impossible using CAD) perhaps wisely, as one can tie oneself in unwarranted knots with this sort of thing – unwarranted because the cause and effect are not of import. Oddly, one of the hanger pivots is dimensioned partly through the 1 in 24 gear inclination and partly through the frame horizontal. Placing the valve centrally over the ports reveals a lap of 1.4375″ and an exhaust clearance of 1/16th. From the eccentric advance there is a nominal positive lead of 0.1075″, increasing to just over 3/8ths in mid gear. 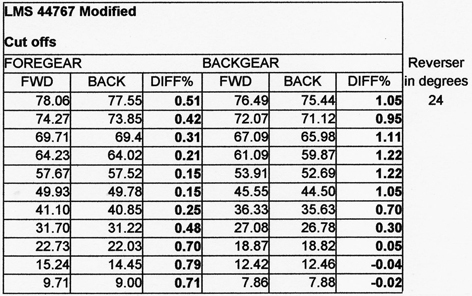 On simulation this reveals very heavy preadmission in comparison to the GWR gears. End clearance of the piston, at 5/16ths, is little different to the GWR standard and one wonders whether the cushioning is rather overdone. Judging from indicator diagrams the GWR gauged the preadmission pressures rather well by applying negative lead in full gear. With the simulator valve-set to favour the best events the leads appear a little more disparate than the official table results and both the events and cut off tables for this simulation are illustrated herewith. 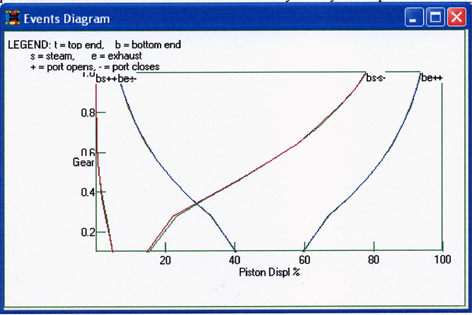 The events graph clearly shows clean events, but with exhaust symmetry slightly to the left, and the disparate leads and overbearing preadmission are prominent in the left hand corner. The good basic quality in the design of the gear is apparent from the almost overlapping event curves and this is a sure sign of intuitive design. The cut off table follows the results expected from the graph and the release figures are also good, though the release at 25% cut off does not better Willie Pearce’s (GWR) 65% penchant of the early 1930s. By 1947 we could have expected this to be much nearer 70%. The preadmission is a worry as this does not feature in the official table in order to draw one’s attention to the large amount, except perhaps through the expansion columns. It is certainly enough to cause problems in a model. By comparison, the Walschaerts’ gear of the regular Class 5s produced considerably less preadmission at 25% cut off, where the release approached some 69%. With regard to performance this may well be splitting hairs, and we are more concerned here with the excellent potential of Stephenson’s gear and the minutiae of the design that can achieve the optimum results. As expected, the simulation does not entirely reproduce the official figures but the resemblance and characteristics are identical. This is to be expected because the simulation produces a geometry without bearing clearances. Both are sourced by different means, though congruence is satisfied. The results are excellent despite some asymmetry in the lifting arrangements. To experiment I made minimal alterations to the gear as follows. To make the lifting link’s excursions more symmetrical I increased the length of the lifting arm by 1.75″ and the suspension offset to 7/8ths. This resulted in the necessity of no more than a 24o angle of the lifting arm for full gear. 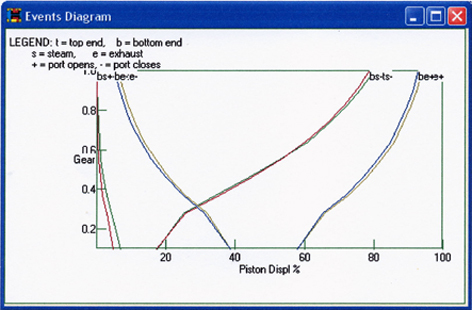 The valve was altered to sit line-in-line with an increased lap of 1.5625″ and reset accordingly. Other than the latter modification, nothing specific has yet been carried out to curb the preadmission, yet already the percentage at 20% cut off has been shaved considerably and the leads equalised. A new graph for events shows the achievements due to minor things which could readily have been diagnosed at the design stage, unless perhaps, the method of producing the events tabulation persuaded otherwise. As a ‘bonus’ the exhaust symmetry has improved noticeably. 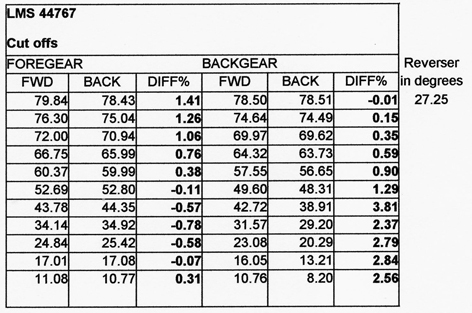 These figures are well within those of the official table and could even be improved to take account of the piston rod in the rear cylinder half. They prove out the efficacy of providing the correct suspension offset in combination with the more symmetrical lifting link excursions. The reduced reverser angle supplies full gear without yielding to large swings. It has to be said in conclusion that it is doubtful that better performance would be detected – it is merely an exercise in correcting the minor issues in the original gear and striving for the best results obtainable from that gear. The initial remit still holds. In the light of a further 50 years of study the original remit would change and a better performance could be obtained, yet the symmetry of the gear could hardly be bettered, and remains better than a Walschaerts’ gear would display. For a model the eccentric angle of advance should be lessened slightly to bring down the compression levels at the shorter cut offs so that we can dash along the track with impunity.